Join our incredible team of summer staff! Working at Brethren Woods for a summer is a transformational experience for staff, volunteers, and campers alike. There are many opportunities to join what God is doing here through volunteer and paid positions. We invite you to prayerfully consider how God might be calling you to join God’s mission at Brethren Woods. 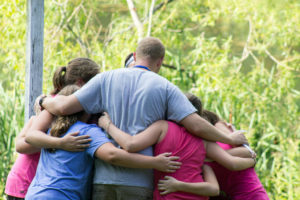 Counselors are the hands and feet of Jesus at camp. They spend more time than any other staff members with the campers. 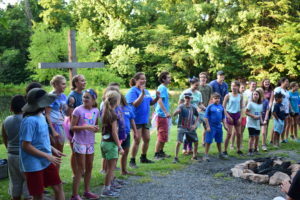 Counselors accompany their campers through the daily activities of Morning Watch, Bible, Nature, and Arts & Crafts classes, swimming, meals, and Vespers services, as well as during the night in cabins. Counselors are committed Christians who are eager to grow in their relationship with Christ and serve as role models to younger disciples. Counselors must be high school graduates. The Arts & Crafts Director is also part of the support staff team, planning and leading Arts & Crafts classes for all age groups. Campers have a blast unleashing their creativity through art as they express what they are learning in visual form. As with all support staff positions, when not teaching, the Arts & Crafts Director participates in the camp community as a role model and supports the rest of the staff in every way necessary to help camp run efficiently. Brethren Woods is known for its tasty food! If you enjoy food preparation and helping to share this joy with others, then a summer in the camp kitchen is the perfect job for you! Each summer we hire several staff to help out in the kitchen. Kitchen staff are part of the ministry and serve as Christian role models not only through the integrity of their work in the kitchen, but in their interactions with other staff, counselors, and campers. There are a lot of buildings on camp property and it is a big job to make sure they all stay clean and running efficiently! If you enjoy behind-the-scenes work that has a big impact, a summer as a maintenance assistant could be your calling! Maintenance assistants have an important ministry role at Brethren Woods, keeping everything running efficiently and serving as Christian role models to all. Swimming is one of the best parts about camp! Safety in the water is very important and lifeguards carry the responsibility of keeping us all safe. Lifeguards also are part of the support staff team and provide leadership in other areas of camp programming, serving as role models and providing assistance when needed. The Nature Director is part of the support staff team, dedicating their time to preparing and leading nature classes for campers of all ages. Experiencing and learning about God’s creation is an integral part of the camp experience. 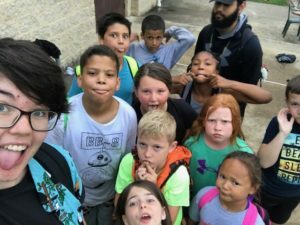 In addition to teaching nature classes, the nature director is part of the camp community as a role model and assistant to the rest of the staff, participating fully in all activities when not teaching a class. Support Staff have servants' hearts, a flexible attitude, and a willingness to help out wherever is needed. Support staff are encouraging, fun, and hard working. Typical duties include helping with camper registration, work in the camp store, help clean buildings around camp, help set up for worship services, serve as a resource person to camper groups, plan all camp activities with the support staff team, and much more! The Challenge Course Facilitator provides leadership on our low and high ropes courses, leading groups of campers in activities that encourage growth, teamwork, and lots of fun! Challenge Course Facilitators must be trained and certified, a cost covered by Brethren Woods. This position is part of the support staff team, which carries expectations of participation and leadership in all areas of the camp community. The Adventure Director is a team player who works cooperatively with the rest of the staff to plan and lead adventure trips. This person is responsible for coordinating trips, getting equipment ready, and making sure all of the adventure trips run efficiently and safely. The Adventure Director typically leads campers in caving, canoeing, tubing and much more! This role is part of the support staff team and is expected to help out in any way necessary and participate in the camp community as a role model. Must be 21 years old and able to drive camp vehicles. Assistant Program Directors (APDs) work closely with the Program Directors in supervising and evaluating staff, offer logistical and organizational support for all summer camp programming, and provide leadership for the camp community. Typical APD responsibilities include assisting with opening registration, planning evening activities, leading camper welcome and orientation, directing the closing program, helping with camper discipline, and offering support to counselors and support staff. Additional responsibilities include helping to lead sessions in staff training and assisting in staff meetings throughout the summer. Qualified candidates will have experience in camp leadership, be detailed oriented and have administrative skills, be comfortable providing leadership in front of groups (for example, leading singing and games), flexible attitude in a fast-paced environment, a willingness to work long hours, a professional demeanor in relating to parents, and able to work as part of a leadership team. *In 2018 donors who participated in the Adopt-A-Staff program helped us raise $400 to give to each staff member. We anticipate a similar amount for 2019, but this amount cannot be guaranteed. Applicants must fill out an application and a Voluntary Disclosure Form before their interview. Returning staff, please contact us for the returning staff application. Please fill out the Voluntary Disclosure Form and return by email or by mail. Welcome to the Brethren Woods' Summer Staff! As explained in your Offer Letter email, hired staff should complete the following employment forms and return them to the camp office, along with their signed Offer Letter, within two weeks. This confirms your employment for the summer. To assist you in preparing for the summer, check out our Staff Packing List and Dress Code. Please also complete a Health Form and bring it along with you when they come to camp. At the conclusion of Staff Training, before working with campers, staff are required to sign our Affidavit Regarding Staff Conduct and Camper-Staff Contact. All summer staff positions are filled, but still want to serve? We need many volunteers to help run the summer camp program. We could use volunteers in many of the areas listed below but especially counselors! More information and an application can be found on our volunteer page.